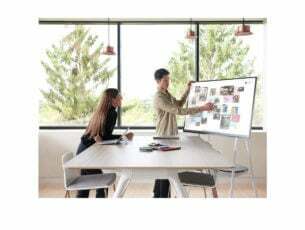 This problem though is not even in Windows 10 – it is in the Upgrade Tool, something that Microsoft built to let users easily upgrade to the latest and greatest operating system with ease and a few clicks. There are various reasons why you might be unable to upgrade to Windows 10, and we are going to cover some of them with a solution but know that there is no way to know the exact issue unless you have an exact error code. Can’t update Windows 10 to the latest version, what to do? 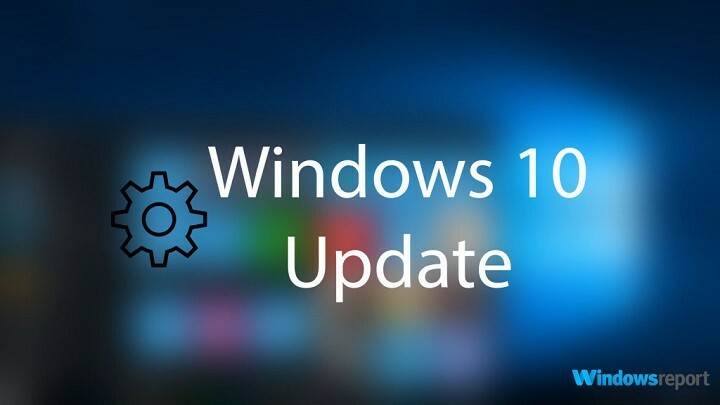 Windows 10 not updating – If Windows 10 isn’t updating, the problem might be your antivirus. Simply disable it or remove it and the issue should be resolved. Upgrade Windows 10 restart, reboot loop – If your PC is stuck in a reboot loop, it’s possible that a driver or software is causing this issue. However, you should be able to fix the problem with one of our solutions. 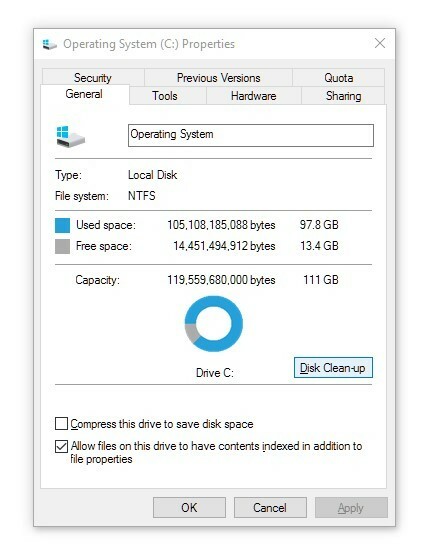 Upgrade Windows 10 not enough space – Sometimes you might not have enough space to perform an upgrade, however, you can fix that simply by using Disk Cleanup or any other tool to free up some space. Having a good antivirus is important if you want to protect your PC from online threats, however, sometimes a third-party antivirus can interfere with your system and it can cause various issues. If you can’t upgrade Windows 10 to the latest version, the issue might be your antivirus. 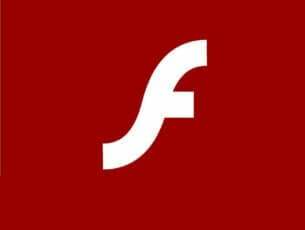 There are several ways to fix this problem, and the first thing that you should do is to disable certain antivirus features. If that doesn’t work, you might have to disable your antivirus altogether. In the worst case scenario, you’ll have to completely uninstall your antivirus software. Once you remove the antivirus check if the problem is still there. If the issue doesn’t appear, it means that your antivirus was the cause behind this issue. To avoid this and similar problems in the future, perhaps you should consider switching to a different antivirus. 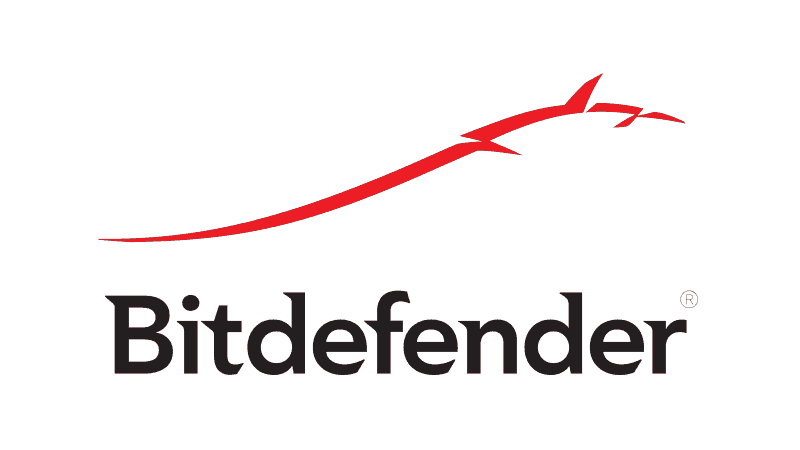 There are many great antivirus tools on the market, but if you looking for a reliable antivirus that won’t interfere with Windows Update, you should definitely try Bitdefender. This security tool has the most powerful scan engine with a great update database, but most important, it is highly compatible with Windows OS. Turning on Data Execution Policy is something you need to do from your BIOS – you will have to follow your motherboard’s guide for this, or simply google the instructions for it. 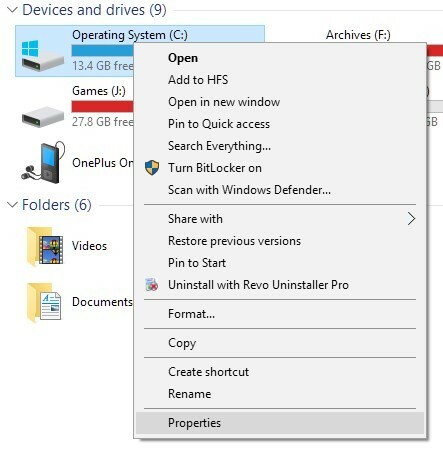 However, there is an option for it in Windows as well – and you might need to enable it there along with BIOS, and this is how you do it. 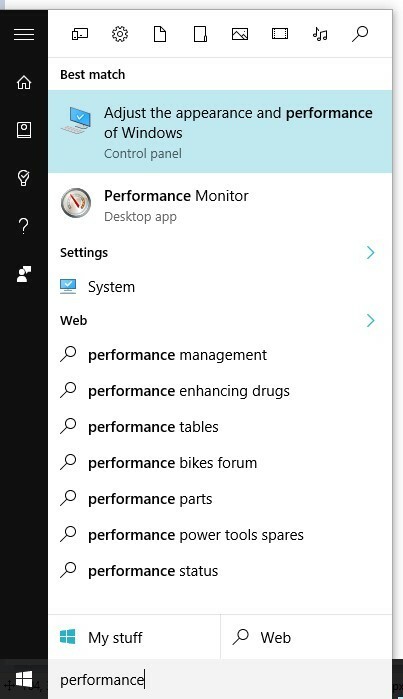 Open the Start Menu and search for “performance” the top result should be “Adjust the appearance and performance of Windows”, click on that. 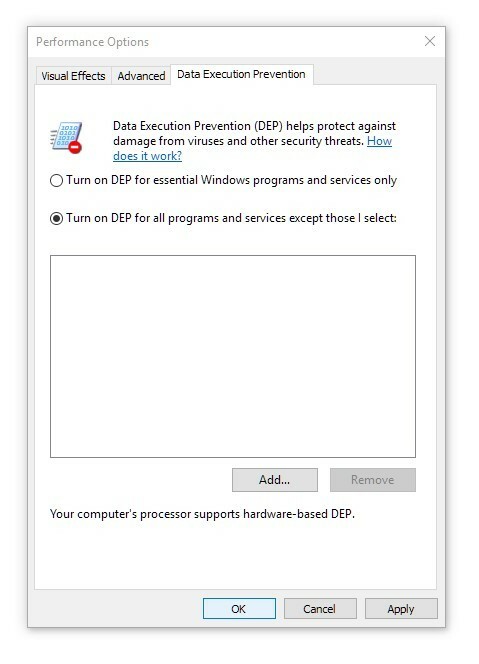 Now open the Data Execution Prevention tab and click on “Turn DEP on for all programs and services except those I select”. Click OK and restart your PC, and make an attempt at upgrading your Windows once more. According to users, sometimes you can’t upgrade to the latest version of Windows 10 due to lack of space on your PC. In order to upgrade successfully, you need to have at least 20GB available on your system drive. Open the “This PC” or “My Computer” window – you should be able to find this in the Start Menu or even your Desktop. 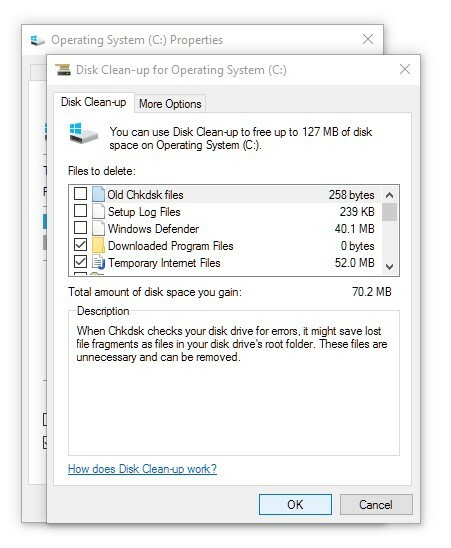 Right click on your C: Drive and click on “Properties”, under the General tab you will see the option for Disk Cleanup – click on it and wait for it to do its work. Once opened, you should see an option that says “Clean up system files” with a shield icon next to it. Click on that and give it administrative privileges. 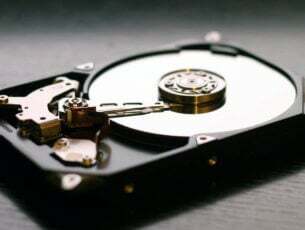 After waiting a minute for the rescan, simply go through the list of files it is going to clean up just to make sure you are not deleting anything necessary and finally clean up the disk. 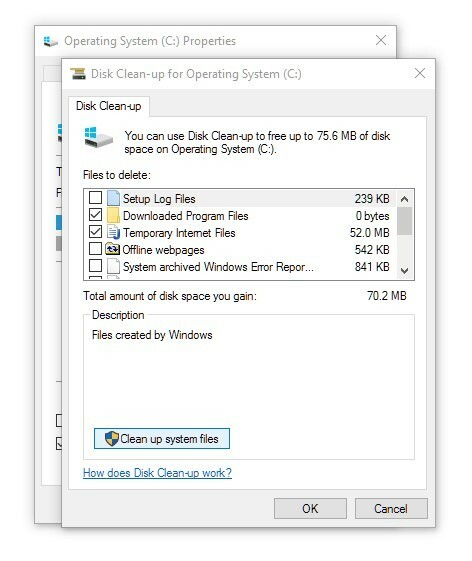 This process should clean up at least a few GB’s off your Windows installation drive and might give you just what you need for the upgrade process. Alternatively, you can also use Advanced System Care 11 to scan your system drive and find and remove old and temporary files. Many users prefer using Advanced System Care over Disk Cleanup tool or other third-party tools since it provides more options for advanced users, so you might want to try it out. This tool is not just lightweight and has an intuitive interface, but also has a wide range of optimization tools that a PC need. This is one of the most used Cleanup tools and it is available for free download. Open the Settings app. To do that, you can just use Windows Key + I shortcut. Select Troubleshoot from the left pane. Choose Windows Update from the list and click the Run the troubleshooter button. Once the troubleshooter is finished, the problem should be resolved and you’ll be able to install upgrades without any problems. Another cause for Windows Update issues can be Windows Update components. Sometimes certain services aren’t running or certain files might be corrupted, and that will prevent you from updating Windows 10. Open Command Prompt as administrator. To do that, just press Windows Key + X and choose Command Prompt (Admin). You can also use PowerShell (Admin). After running these commands, check if the problem with Windows Update is resolved. If you don’t want to type all these commands manually and run them one by one, you can always create Windows Update Reset script and run the commands automatically. If you can’t upgrade Windows 10 to the latest version, you might be able to circumvent this issue simply by downloading and installing the latest updates manually. All Windows updates are available for download from Microsoft’s Update Catalog, so you can easily install them on your own. Visit Microsoft Update Catalog website and enter the update code in the search bar. You’ll now see the matching updates. Find the update that has the same architecture as your operating system and download it. After the update is downloaded, double-click it and follow the instructions on the screen. Once the update is installed, the problem should be completely resolved. Download and start Media Creation Tool. Select Upgrade this PC now and click Next. Pick Download and install updates (recommended) and click the Next button. Now you’ll need to wait while the updates are downloaded. This can take a while, so you’ll need to be patient. Follow the instructions on the screen. After you get to the Ready to install screen click Change what to keep. Select Keep personal files and apps and click the Next button. Follow the instructions on the screen to complete the setup. After the upgrade process is finished, the issue should be resolved and everything will start working again. There are various reasons why the upgrade process could fail – and usually there is no way to find out the exact reason for it, all we can do is give some solutions a shot and hope for the best.